The now redundant Aberystwyth Town Hall, which sits at the Queens Road end of Portland Street is to be turned into a library it has been announced. The site was closed over a year ago as Ceredigion County Council moved into its new offices on Boulevard Saint Brieuc. However, on the first day of the closure, a total of 75 staff did turn up to work at the old site. Funding for the project is being provided by the Welsh Assembly, in partnership with Ceredigion County Council, and work is hoped to be completed next summer. On this site previously stood another town hall, which was built in 1903. This grand town hall was then burnt down in 1957 on the 8th of September. 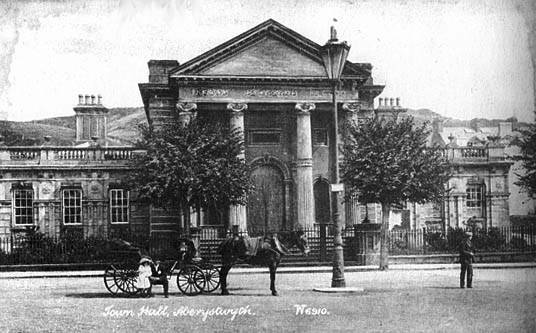 The previous town hall was a much grander looking building than the one which stands today, as you can see here. However, it is felt that it has an “imposing look which dignifies the town”, hence the decision to make further use of it.